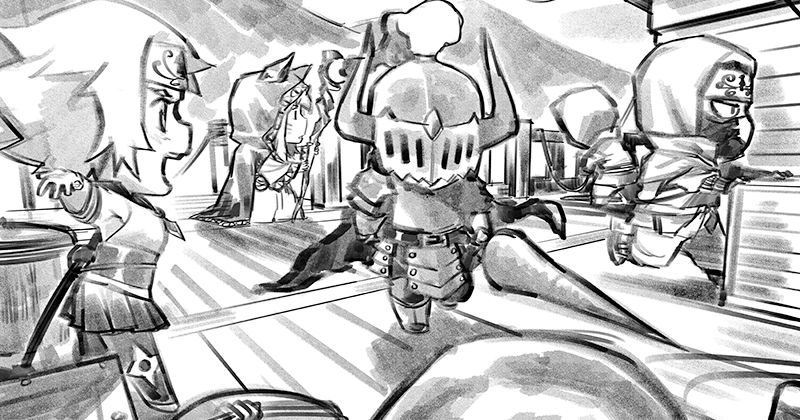 The fantasy chibi games of Super Dungeon Explore and Ninja All-Stars are teaming up. Yes, like a galaxy merger, the two are joining together into an even bigger super-game. Ninja Division has announced that it is coming out with rules and cards for running the different Ninja Clans in games of Super Dungeon Explore. Ninja Division Publishing and Soda Pop Miniatures are excited to announce that the ninjas of Ninja All-Stars are coming to the popular Super Dungeon line! Beginning June 27, clan boxes, heroes, and ronin for Ninja All-Stars will be reissued as expansions for Super Dungeon, beginning with: Clan Kitsune (Warband), Uzumaki (Hero), Hanzo (Hero), and Jorogumo (Dungeon Boss), with additional expansions reissued monthly. These expansions will feature new Super Dungeon packaging and all of the cards necessary to play in Super Dungeon: Arena, Super Dungeon: Explore, and Super Dungeon: Arcade. Additionally, each wave of releases will be accompanied by Super Dungeon x Ninja All-Stars Upgrade Deck. Each quarterly upgrade deck will contain the cards necessary for retailers and distributors to upgrade their existing stock and for customers to play using their existing Ninja All-Stars collections, for use in Super Dungeon. Monthly releases and upgrade decks will be available through ninjadivision.com and all your normal retail and distribution outlets.